Rebbe Nachman of Breslov was married twice. 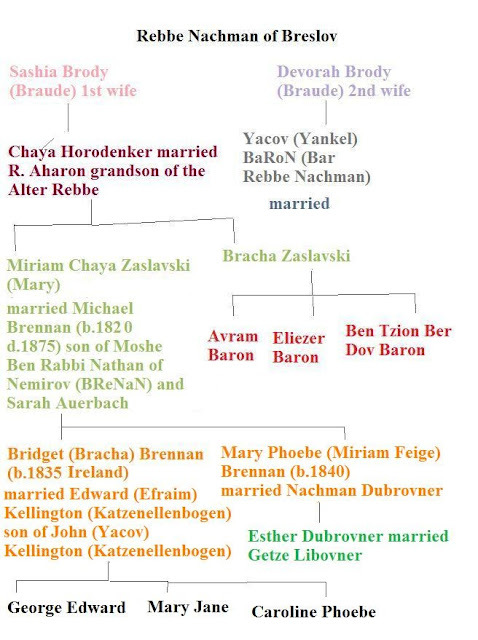 His first wife Sashia of Brody (Alexandra Body/ Braude) was the daughter of the secret Frankist Rebbe Benjamin Ephraim Braude (aka Alexander Margoliot/ Sender Brody) of Sheklov. She was the mother of most of his children. 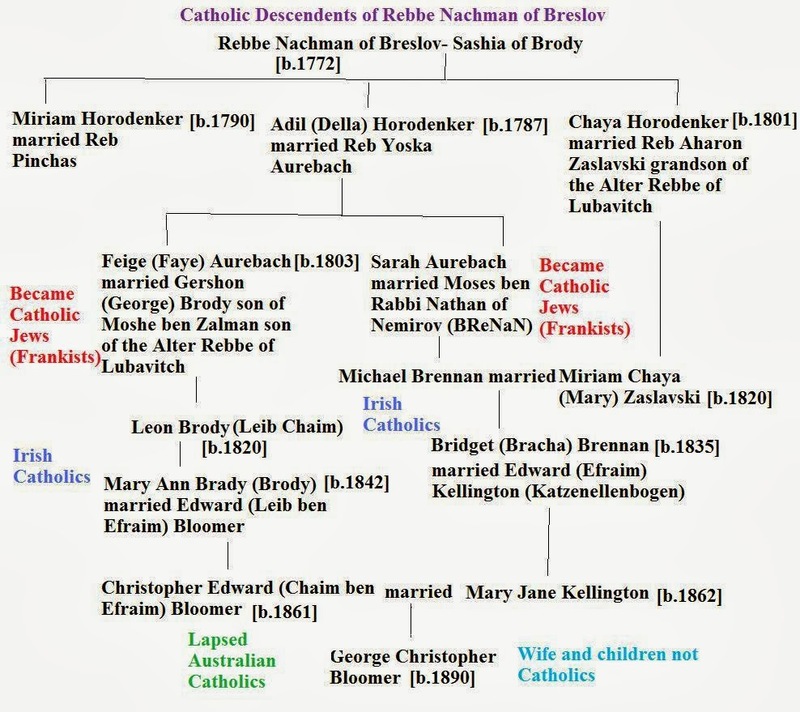 His wife died in 1807 and he remarried soon after to Devorah Brody (Braude) a daughter of the Frankist Rebbe of Sheklov and his second wife Rachel Mayer a granddaughter of Rebbe Jacob Frank. In 1808 Rebbe Nachman disappeared with his new wife to Lvov for 8 months to await the secret birth of his son named Jacob ben Rebbe Nachman (BaRoN) who he left with the Frankists to rear. This son later used the name Yankel Baron. After the conception of Yankel, Rebbe Nachman and his wife entered into a celibate relationship when in Lvov he was secretly ordained as a secret priest and Bishop of the Greek-Catholic Church for the Frankists hidden in the Jewish communities by Archbishop Antin Angelovych. Yankel Baron (b.1808 Lvov) married Bracha Zaslavski (b.1819) a daughter of Aharon Zaslavski and Chaya (b.1801) a daughter of Rebbe Nachman. Bracha's sister Miriam Chaya Zaslavski (1820-1860) married Michael Brennan (b.1820 Sheklov) a grandson of Rabbi Nathan (Nosan) of Nemirov the Chief Disciple of Rebbe Nachman. Michael's father was Moshe ben Rabbi Nathan of Nemirov (BReNaN/ BRENN) who became a follower of the Alter Rebbe's son Moshe ben Schneur Zalman [who had become the leader of the Jewish Catholics (secret Frankists)]. Moshe (b.1795 d.1865 Kilkenny Ireland) and his wife Sarah Auerbach (b.1807) (daughter of Adil and R. Yoska) was removed from the family tree and records of the family by the Jewish community. Aharon Zaslavski and Chaya also had a son Yechiel Zaslavski and two other daughters Rachel and Adil Zaslavski. Michael and Mary Brennan settled in England and Ireland with other family members who had become Catholics. Michael Brennan joined the 40th Regiment and put his age down by about 5 years. He served in Afghanistan, India and Australia. 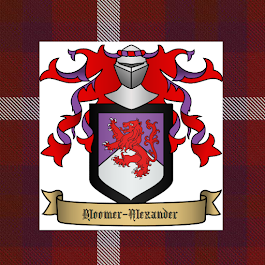 He came to Perth Western Australia in 1865 as an enrolled pensioner guard. His daughter Bridget (Bracha) came to Perth in around 1873 with her family. Another daughter Mary Phoebe (Miriam Feige) Brennan (b.1840) on a visit to Sheklov married her relative Nachman Dubrovner (the son of Efraim Dubrovner a grandson of Rebbe Nachman). Michael also had a brother Daniel Brenan (or Brennan) who lived at Gallowshill near Gowran in Kilkenny. He should not be confused with Daniel Brennan of Flagmount near Gowran. Yacov Baron (Yankel) was the father of at least three sons Ben Tzion Ber Dov Baron of Lithuania, Eliezer Baron of Minsk and Avram Baron of the Ukraine by his wife Rachel (Feige Rivka) Brennan (Brynin) a daughter of Moshe (Michael) Ben (or Bar) Rabbi Nathan of Nemirov (Brennan) and his wife Miriam (Mary). 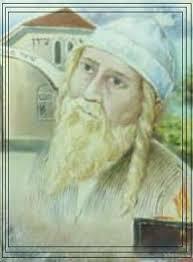 Yankel Baron's grandson may have been Rabbi Shabetai Baron the father of the famous writer Devorah Baron (b.1887). What is a Catholic Jew? A person is whatever their mother is, according to Jewish law. 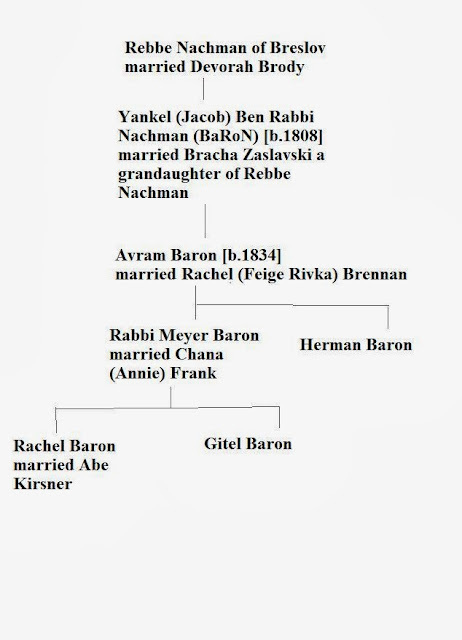 This is factual as well as the fact that I am a direct descendant of Ben Rab Nachman, via my father's mother Rachel (Baron) Kirsner/Kirshner who was the daughter of the famous Talmudic scholar and commentator on the Talmud and teacher of rabbis in yeshiva, Chana Zesa (Frank) Baron, daughter of a Talmudic rabbi and she was married to Meyer Baron, a rabbi who had a school with her in Vilkiji, Kaunus pre WW2, and they had my grandmother Rachel and her sister Gitel. 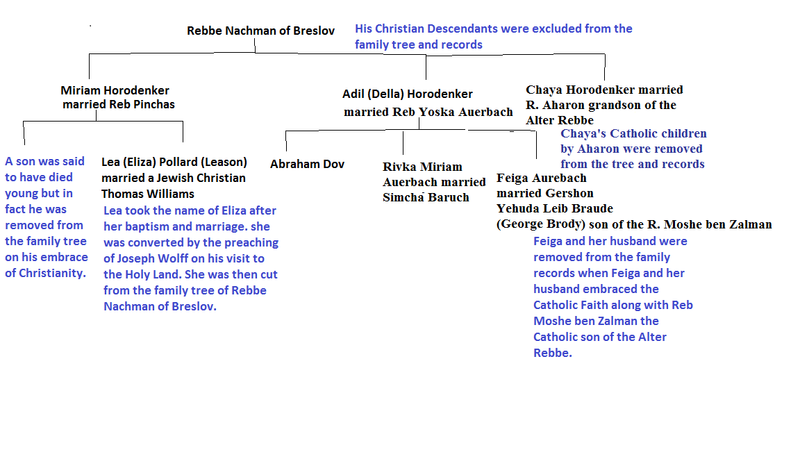 My grandmother was very proud of her heritage and descent via her father directly from Rabbi Nachman. They were khans. My father was her one son, Samuel Joseph Kirshner and my aunt Miriam Eve Ann IKirshner) Koenig was my father's older sister. She had no children. My father had three, my brother Mark Geoffrey Kirshner and my me Karen Lynne Kirshner (named in honor of my great grandmother's memory) and Abby Joy Rothschild Kaplan who is my younger sister. She had two children Rachel Alexandra Rothschild and Jonathan Charles Rothschild. 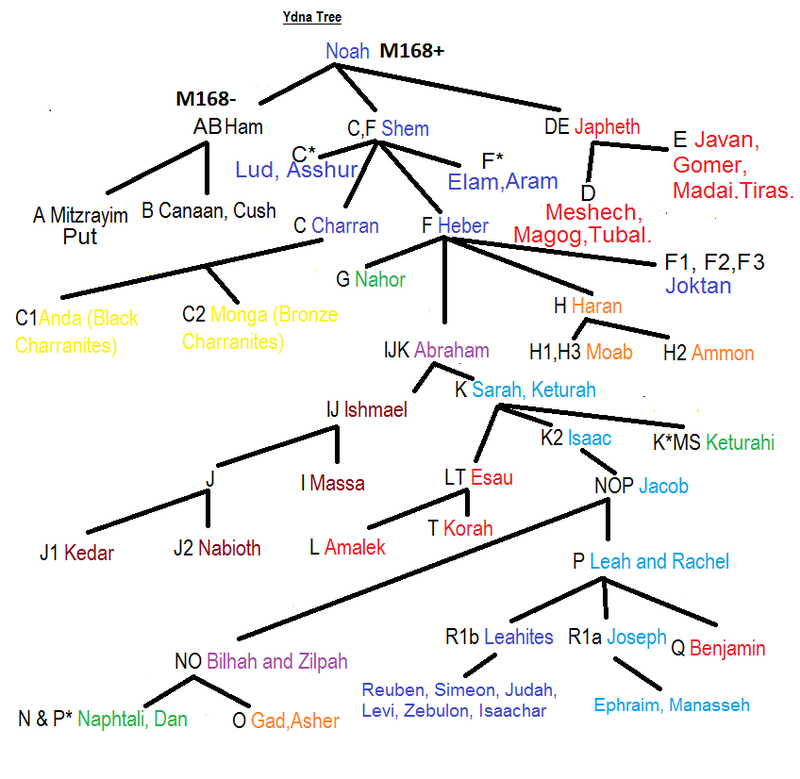 We are direct descendants and fully Jewish. My grandmother's sister had four children and was married to a Segal. They had two older boys who were gifted swimmers and athletes and linguists. They worked underground in the resistance during WW2, helping Germans and others escape. They were each caught, tortured and shot, and only the parents Gital and her husband and my father's two first cousins, Rabbi Shimon Segal and Zena (Segal) Niznik survived the concentration camps. The parents were murdered there. Shimon is the only survivor and lives in Borough Park and Muncie, NY and Israel. He is in his latter 80's and like his sister who married the head of the Bet Din in Canada, he did not have any biological, nor any other children at all. She had adopted a son Chaim Niznik, a psychiatrist, who died young- around age 40. 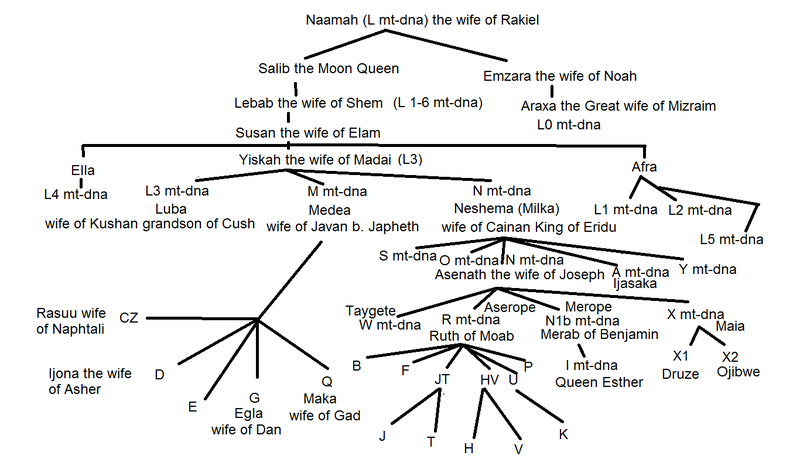 We are the direct descendants. We are fully Jewish. I never heard of a Jewish Catholic, but Jesus was Jewish, so Catholics who believe in him are essentially Jews once removed.